We were very sad to say goodbye to APP’s Treasurer and Trustee, Sue Blamire, who retired at the end of March 2018 after 8 years. Staff and Trustees had a whip-round for a thank you present. Sue was a founding Trustee of APP and helped to set us up as a charity in 2010. Sue became our Treasurer, not only performing this role for us, but also being our Finance Officer, book-keeper, HR advisor, general employment practices researcher, along with many other roles besides. Sue has decided, with the birth of her 4th grandchild and a house project on the go, that it is time to retire as a Trustee. Dr Jess Heron says: “I cannot thank Sue enough for all she has done in her years as Trustee and Treasurer – for her tenacity in sorting out the paperwork to set us up as a charity, in managing APP finances, her incredibly hard work at keeping us current, and for her willingness to stick with us as the work mounted. APP has grown beyond recognition since 2010, and at times, the job of Treasurer and managing APP finances became an almost full time role. She leaves her role as Treasurer with healthy books, a clear picture of our financial position, good relationships with Auditors and a close collaborative relationship with APP staff who will take over the management." 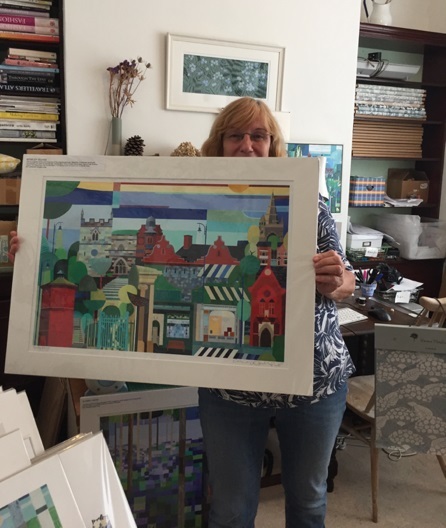 Sue recently got in touch to say "Thank you so much for arranging the leaving gift of the beautiful Emma Hardiker picture. I really love it and its going to take pride of place in our new kitchen/living room when we move. It was very generous of people to donate and I’d appreciate it if you would thank everyone for me."